Racing wrapped up today at the 2009 Knickerbocker Cup hosted by Manhasset Bay YC in Port Washington, NY. We had one race of the quarter finals to complete before racing for the finals started. Our team had a shot at making the semi’s, but unfortunately we needed a couple of things to happen. They didn’t happen, and we ended up being eliminated and finishing 6th overall. Our one race today was sailed in breeze that started in about 3-4kts and died to about 0-1kt. We were racing Rick Fornander from Sweden. We had a great start and headed to the left like we had planned. As we went up the beat, the wind died and went right. Unfortunately, we were on the left, but caught up on the downwind leg to be about two boat lengths back, but the wind shifted left on the next beat. The hard part of a two-boat race is when the left is favoured and you are behind, it's hard to get to the left of someone. The second downwind leg was a bit of a guess as to what the breeze was doing. We had a puff, then they had a puff, but we didn’t get enough of a puff to pass. We lost the race, and ended up loosing the tie to Rick in the overall rankings. We ended up 6th out of 12 teams. We are happy with the result considering that we haven’t sailed match racing for a long time, but we are hungry for more. We learned a lot and made some silly mistakes that cost us too. The semi’s are still going on right now, so we don’t know the results, but you can check the overall results at the event website. 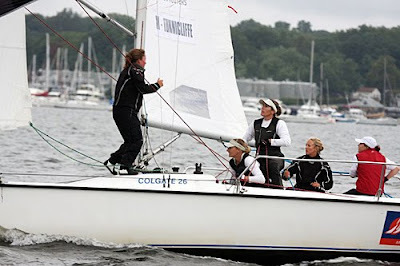 Our next event is the Detroit Cup that starts on Wednesday at Bayview YC in Detroit, MI. The Detroit Cup is also a ISAF Grade 2 Open event, very similar to the Knickerbocker Cup. We will be seeing a lot of the same competition in Detroit, so we know it will be good competition. I would like to thank Carmeuse and Gill for sponsoring us at this event.